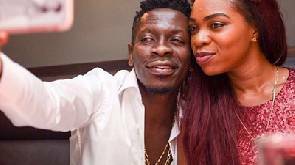 Continuously appearing on the Delay show for the second time, Shatta Wale, who now prefers to be called “Dancehall Champion” has made wild revelations about his relationship with his baby Mama, Shatta Mitchy. When asked whether Mitchy doesn’t get mad over his disloyalty, he said: “I always apologize and Mitchy accepts it”. Shatta Wale told Delay, he’s done with the traditional rites with marrying Mitchy and he’s planing a big wedding soon.